Why can’t I remember the perfect blog topic I thought of this morning? This seems to be a writer’s dilemma. So I went to a local craft store and bought a dry-erase board. 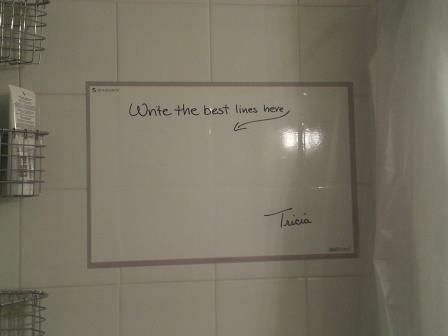 I hung the board in my shower. It dawned on me that I have many ideas while standing there without a pen or paper in sight. Too many times I’m left repeating a “great line” over and over again hoping I remember it by the time I get to my desk. Too many times the words have been forgotten. This may sound practical or it may sound crazy. It’s also accepting that a perfect idea can be fleeting. Or at least an idea can be fleeting. It can take a while to discover if the idea is great or not. With this blog, my new book, and all the various other writing I work on each day, I can’t have ideas getting lost. Many are washed away and spiral down my shower’s drain. Who knows, this might lead to me making a grocery list or notes about my personal training clients on the board. Or “Increase Daphne’s plank time”, or “Buy milk”, or “More BOSU ball exercises for Pat”. It might mean I spend more time in the shower. I look forward to messages from the “green” fanatics that believe we need to conserve water (don’t fret, I own a low-flow showerhead… save your complaints for someone else). When I was young I don’t remember the need the write everything down. And there lies the issue, I can’t even remember that. Reality check: I take long showers and I am an old writer. I have to write everything down, but I had not thought about your shower idea !! Don’t let the water run cold. Nice one! No need to think up more Bosu exercises for Pat. I have it on good authority that Pat is full up with Bosu things. Don’t the words come off in the shower?? I want whiteboard finish on my kitchen cupboards. What a great way to quickly write down groceries when you use the last one. Then on grocery day you could take a picture of the cupboard and you have a grocery list!